It’s December 1st in Antarctica. When I first heard Margot Talbot’s voice on the radio this morning from Vinson Base she happily reported that those extremely high winds and the very bad visibility had gone away, vanished and she had clear skies and good visibility at Vinson Base. It was nice to hear that report from her. Michael Fagin who many of you will remember from West Coast Weather in Seattle who does our Everest forecast, is dabbling in Antarctica forecasts and doing some forecasts for us. He had reported to Shelley, who reported to me that today, Thursday, watch for some increasing clouds around Vinson and I am not very happy to report that Michael is once again right, even though we had Margot have good weather at Vinson Base, overall from a southerly direction we have seen more clouds move in today. Jaco the South African meteorologist stationed back at Patriot Hills main concern and it’s a big one is to get that Ilyushin in and then off the blue ice runway. We are sending him our weather observations from here. There are four teams at Camp 1. No one is going up today. There are many old colleagues of mine that I have known for years that have operated not only here in Antarctica but in high mountains around the world. I figure that since 1988 the little group of us here have more than 20 ascents of Vinson under our leadership. We are in agreement that this is the worst weather we have seen, certainly in terms of cold temperatures. And now as Michael said the clouds are coming in. 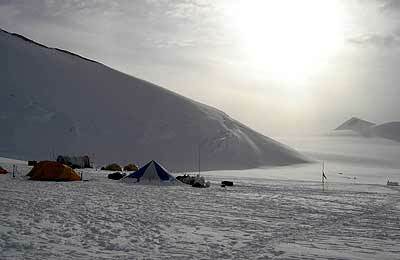 Woodie, Martin and I have now returned all the way down to Margot at Vinson Base to see what is going to happen. The other teams are still at camp 1, like I said no one went up today. I’m going to mention some anniversaries. One anniversary that is important to me is 39 years ago this month, the first ascent of Vinson was made. John Evans was on that trip, along with Nicholas Clinch and a lot of other great climbers and explorers. The second anniversary today is six weeks ago to the day Woodie Vaughan had his appendix removed in Atlanta. So congratulations to Woodie for making it to Antarctica after that significant surgery. We are fine down here at Vinson Base. Margot gave us a hot cup of tea when we came in. We are watching some cloudy skies and we’ll see what develops next.